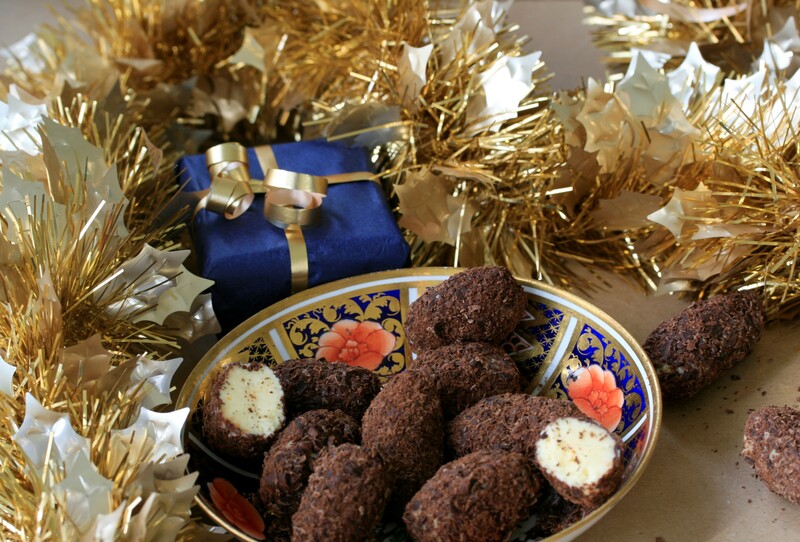 These are my favourite Christmas Truffle recipes. A white chocolate truffle, scented with honey, orange, a touch of marzipan and the tiniest hint of salt; and a handsomely dark ginger truffle log . What can I say about these delights? Once again they make ideal gifts, or make now and store them in the fridge for your own Christmas entertaining. They are both easy to make and deliciously different – not even a great deal of mess – apart from the grating of the chocolate – so here is a useless fact, and a useful tip, to cope with flying static chocolate. Google the question why is grated chocolate static? and there are more questions than answers. The science goes something like this…. Whenever any two surfaces contact and then separate there is an exchange of electrons between them. Metal (i.e. the grater) is a good conductor of electricity so electrons leave it easily. Chocolate has a high resistance to electrical flow (due to its high fat content) so electrons don’t leave easily . On contact with the grater the chocolate gains electrons (from the grater), plus the little bits of grated chocolate contact the grater twice causing a build up of charge on both sides of the shaving. And the result – flying chocolate all over the kitchen. Any science boffins out there who have more information please feel free to comment. So how to reduce this irritation? I found a number of suggestions – one is to wet the chocolate, because water is a good conductor of electricity. However, that probably wont do much for this recipe. Another is to cool both the chocolate and the grater in the fridge before grating. Other people suggest ‘grounding’ the grater, I wasn’t quite sure if this meant that I should don wellington boots, but I think it meant find a rubber mat. Anyhow it gave me the idea that rubber or latex gloves might do the trick and in indeed they did, just so long as the glove is in contact with the metal part of the grater. Break the chocolate into a small heatproof, placed over a over a pan of recently boiled water. Make sure that the base of the bowl does not contact the hot water and that it fits snuggly over the pan. Alternatively put the chocolate into a microwavable bowl and melt in the microwave on medium for about 1-2 minutes stirring occasionally. Set it aside to cool. Either way take care not to over heat the chocolate or it will be difficult to work with. Stir in the cooled melted chocolate. Set the ganache to one side until it is beginning to firm enough that yo can roll it into balls. Grate the dark chocolate onto a flat dish or tray. 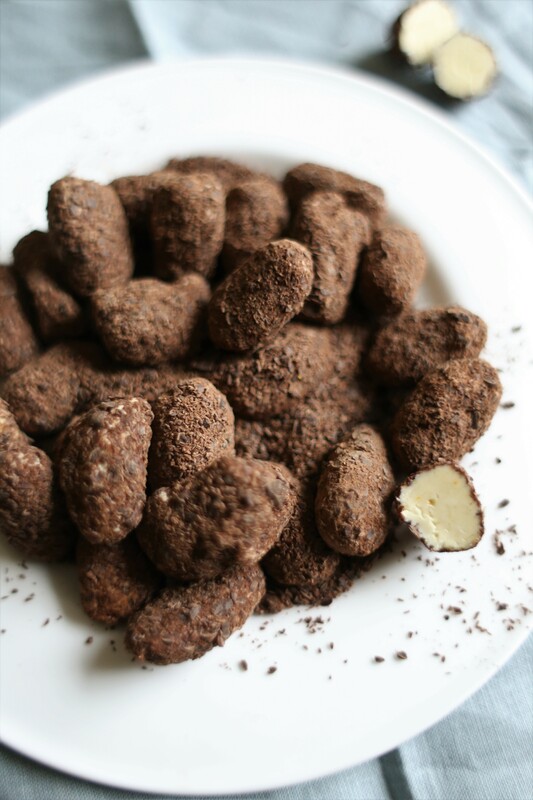 In batches of ten take ½ teaspoons of the truffle mix and roll into a sausage shapes and then roll them in the grated chocolate. Set the truffles onto a tray and when all of the ganache is shaped and rolled tip any remaining grated chocolate over the truffles. Leave then in a cool place to set. Once set I store mine in a zip lock bag along with the lose grated chocolate in the fridge. They will keep for 2-3 weeks. 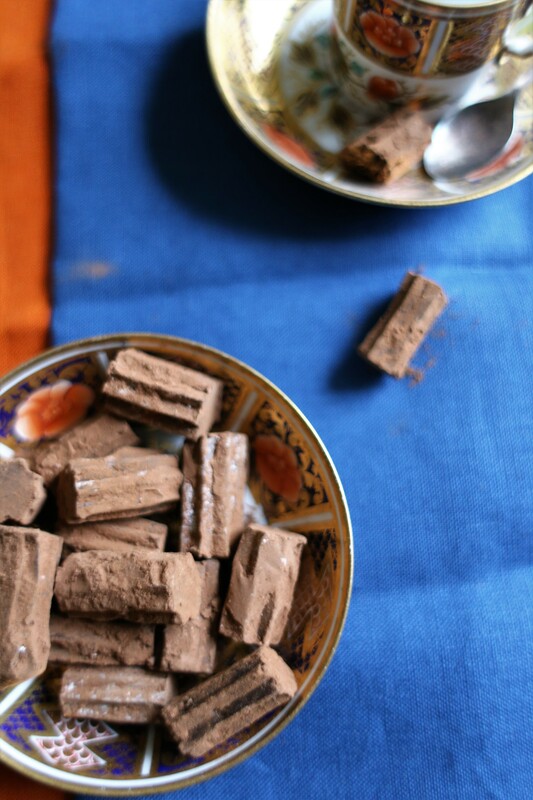 Remove the truffles from the grated chocolate at least an hour before serving to allow them to soften. Very finely chop the bulb of crystalized ginger and put it into a small pan or a microwavable jug along with the two tablespoons of syrup and the double cream. Stir in the ground ginger. Heat the cream to scalding point and then set it aside to cool. When the chocolate and the cream are both cooled to a warmish room temperature pour the cream into the chocolate and stir to mix. Blend in the softened butter. Leave the glossy mixture to set until it is thick enough to hold its shape but still lose enough to pipe. Spoon the mix into a piping bag fitted with a large open star nozzle. Pipe long strip of truffle onto a flat baking sheet lined with parchment. Spoon the cocoa powder, ground ginger and the icing sugar into a small sieve – don’t mix them together. Sprinkle over the ganache logs and then leave then to set before cutting into 1.5cm pieces. Refrigerate to set. Once set I store mine in a zip lock bag along with the spare powdered chocolate in the fridge. They will keep for 2-3 weeks.